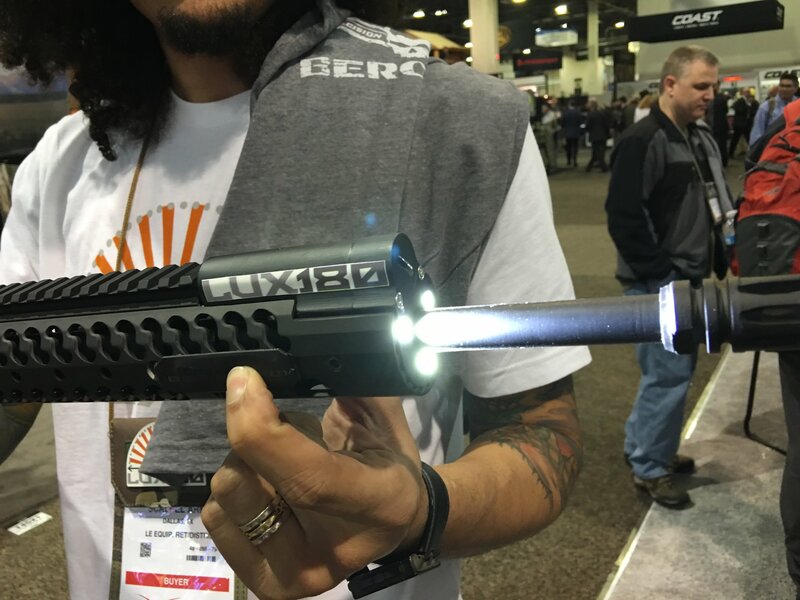 LUX180 Model 34-36 Multi-Color LED Weapon Light for Tactical AR-15 Rifle/Carbine/SBR’s! (Video!) | DefenseReview.com (DR): An online tactical technology and military defense technology magazine with particular focus on the latest and greatest tactical firearms news (tactical gun news), tactical gear news and tactical shooting news. 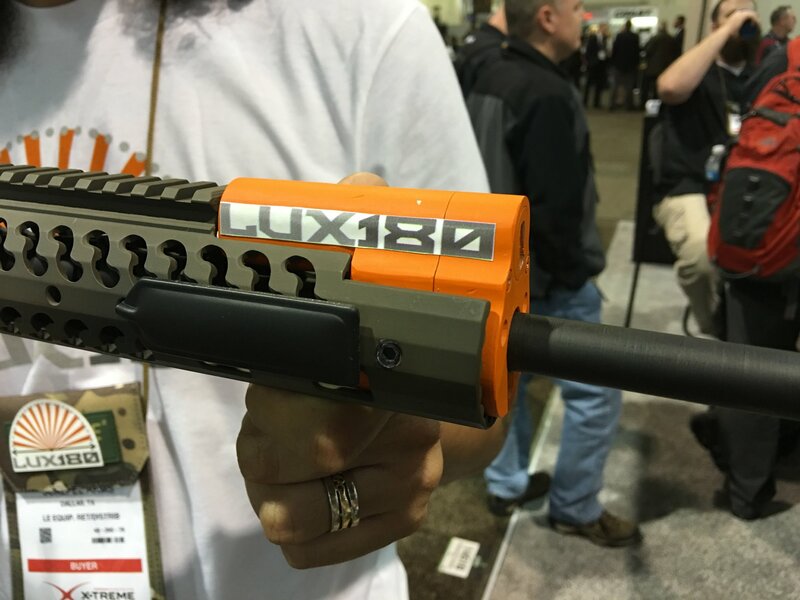 Perhaps the most fun and interesting aspects of SHOT Show for DefenseReview (DR) is discovering new, interesting and innovative products designed and developed by small companies one’s never heard of, and didn’t know existed. 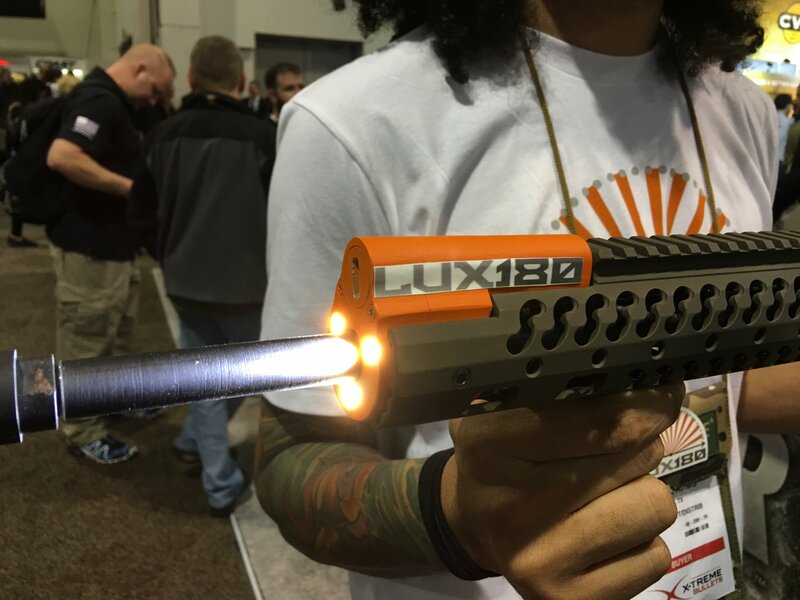 LUX180 is just one of those companies, and the LUX180 Model 34-36 LED Tactical Weapon Light for tactical AR (AR-15) carbine/SBR’s is just one of those products. 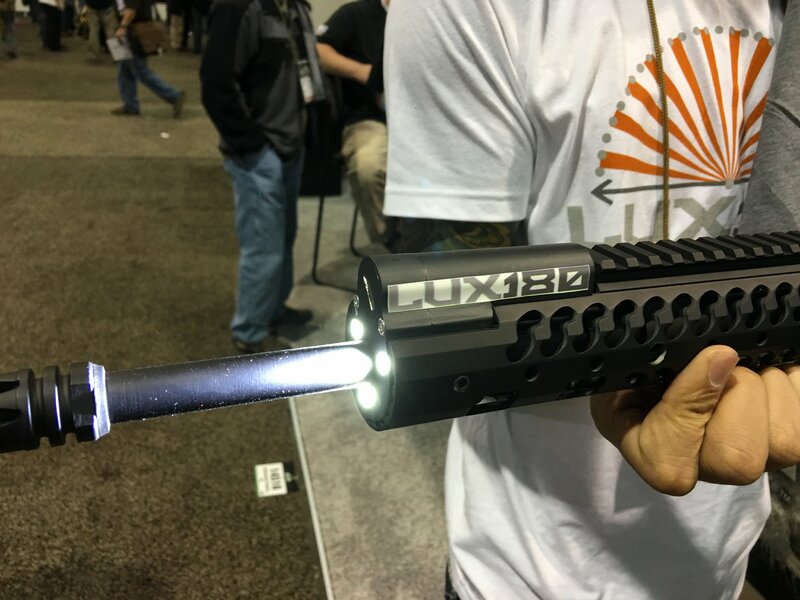 Made of “aerospace aluminum”, the LUX 180 34-36 integral weapon light puts out 600 lumens, fits seamlessly onto Samson EVO EX tactical hand guard/rail system, and is designed to be used with a standard .750″ barrel diameter. It sports 3 mult-color LED light emitters powered by a single CR123A battery. The lights are pressure switch-activated. 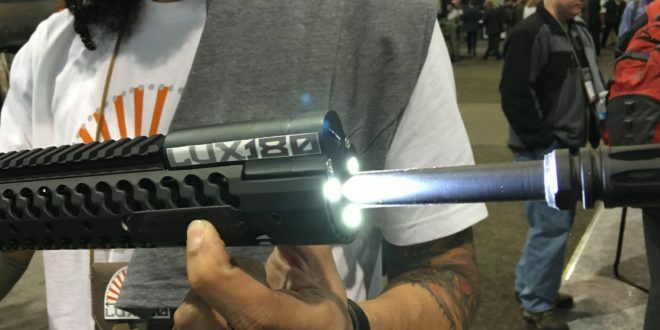 LUX180 claims that the Model 34-36 LED tactical weapon light is “rugged and can withstand the most extreme situations.” They also claim that it’s “water and shock resistant”, and “does not interfere with barrel harmonics and operates flawlessly on the AR-15 platform under normal firing conditions. ” Sounds pretty good. 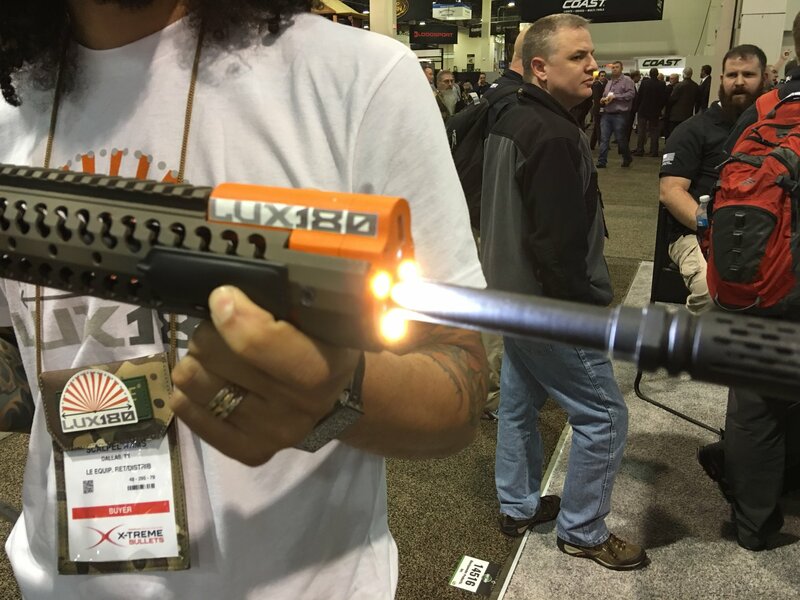 DR liked what we saw of the LUX180 Model 34-36 tactical AR weapon light prototype at SHOT Show 2016, and we hope the product lives up to the hype. Assuming it does, we also hope other AR tactical handguard/rail manufacturers start making rails specifically for it. Defense Review obviously also looks forward to running the light at the range when we can. One of our tactical AR’s is an Adams Arms AA EVO Ultra-Light 16″ carbine with a lightweight pencil barrel, so we hope it’s compatible. The Model 34-36 is a fully integral weapon light featuring 3 LED emitters and powered by one CR123A battery. The Model 34-36 is designed to be used with a standard .750 barrel diameter and Samson EVO EX hand guard. The Model 34-36 is activated using the provided textile pressure switch and can be mounted using various mounting options. The CR123A batteries can be removed and replaced using the coin slot cap at the front of the unit with out removing the unit from the hand guard. Built out of aerospace aluminum the Model 34-36 is rugged and can withstand the most extreme situations. 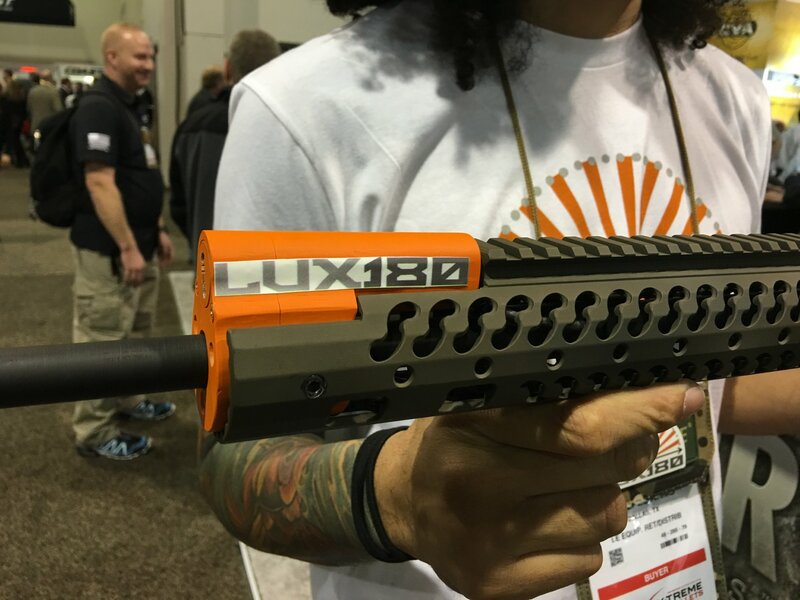 The unit is water and shock resistant, it does not interfere with barrel harmonics and operates flawlessly on the AR-15 platform under normal firing conditions. The model 34-36 is built for the AR-15 rifle and is intended for close quarter applications. Its 180 degree light output is designed to illuminate a room or area the user is operating in. This dispersion of light is intended to give the operator a better picture of their environment. Utilizing three emitters is the most efficient way of eliminating barrel shadow while providing the most light output and run time.